While I wasn’t able to attend the D23 Expo this year because well, I’m on the East Coast, Shawn was nice enough to send us a great report of the event! I’m jealous of everyone who was able to attend and check out “The Avengers” panel. I’m dying to see the footage. I can’t stress how badly I need this movie to come out. Enough of my ramblings, here’s a great recap by Shawn! 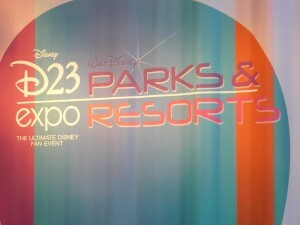 Although I’d been a spectator from afar for quite some time, 2011 marked my first venture to Disney’s D23 Expo. In the interest of full disclosure, I think it’s important for you to understand that I am a Disney fan, but I’m probably not what you’d consider a Disney fanatic. I have a season pass to Disneyland and have been to Disney World a number of times, but I don’t purchase much in the way of memorabilia and I’ve never been to Club 33 (does having a knowledge of Club 33 make me a bit of a fanatic?). 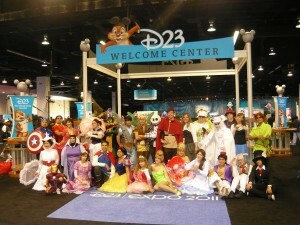 So, although I knew of the D23 Expo in the past, I had never thought it was an event that was necessarily for me. That being said, the ever-expanding Disney Empire lured me for this event with their relatively new acquisition of Marvel. In order to prepare for the event, I began following the many discussions on Twitter about #D23 and #D23Expo. As a result, I decided to follow the advice of @evico and purchase a D23 membership for the first time (but not the last). The minimal membership was only $35 and immediately earned a $7 discount on each tickets, an exclusive watch, and, most importantly, access to the show an hour before the regular public. Although the D23 Expo is not the size of a San Diego Comic-Con (SDCC) or a New York Comic-Con (NYCC), anyone that has been to one of these events can appreciate how much entry an hour early would mean to the overall rhythm of the day. Although we did not hit the exclusives hard like other events (as I said, I’m not a huge Disney collector), the extra time the membership gave us did allow us to grab extra swag and to get to the front of the line at many of the more popular exhibits. This meant that the rest of the day had a much more relaxed tone, as that one hour provided us with several hours worth of fun and entertainment. For those of you that might attend the next D23 Expo, my first two pieces of advice: 1. Follow @evico on Twitter and 2. Get the D23 membership. Regarding the entertainment value of the event, although the tickets are a bit pricey ($47 per day without D23 membership and $40 per day with it), there are a number of great panels throughout the weekend. The big news of the weekend that emphasized part of this point is that with Marvel on their side (or vice-versa? ), D23 Expo pulled off what SDCC could not this year and hosted an Avenger’s panel. Not only did this panel feature the wit of Robert Downey Jr., but it also included exclusive clips of the new movie. Furthermore, they followed this up with another entertaining panel on Sunday where Joe Quesada, Chief Creative Officer of Marvel Entertainment, held one of his “Cup O’ Joe” talks, where he led a discussion on the history, psychology, and sociology of the Marvel Universe. Beyond Marvel, Disney also utilized its other relationships and provided exciting panels related to Pixar and ABC (really sad I missed their panel on the new show, Once Upon a Time). Beyond these “fringe” relationships, the heart of the content was directly Disney. With a number of panels led by Imagineers, attendees had many opportunities to look behind the curtain to get a glimpse of the inner workings of Disney. Additionally, for the younger crowd, the D23 Expo had near constant programming tied to their Disney Channel shows. Although Lemonade Mouth and So Raven! may have not been on my “must see” list, the teens, tweens, and little ones seemed to have a blast with the many panels and performances in this vein. Unlike many conventions where programming, vendors, and talent are the most important elements, D23 Expo also had many interactive experiences and exhibits. Of these, the Carousel of Projects was probably the most popular. Mimicking the original, Carousel of Progress, this exhibit gave attendees a number of glimpses at upcoming attractions that Disney has in the works. From the renovations of California Adventures to the addition of a new ship in the Disney fleet, the Carousel of Projects offered attendees the opportunity of getting up close with some of the interactive elements that would soon be making their way into the Disney Kingdom. Of the items featured in this area, the replica model of Disney World’s new Fantasyland was by far my favorite. Having just been to Disney World a few months ago, it was particularly interesting to see what is being built behind those barricades I had just recently seen. Without a doubt, I found the D23 Expo to be an extremely enjoyable event. That being said, I do understand some grumblings I heard about the lack of presence by other Disney properties (ie. ABC, ESPN, Marvel, etc.) on the showroom floor. I think a Marvel booth, armed with free Avenger posters and shirts would have gone a long way to further integrate the company into the Disney family. So, although I was surprised that there wasn’t a stronger presence by some of these properties, I also understand that Disney is a successful business that is very pragmatic about their undertakings. Having seen the hysteria surrounding the new addition to the family, I’d be very surprised if Marvel (and others) aren’t more visible the next time around. In addition to the discontent about the lack of Marvel, I spoke to some who also felt the vendor room was a letdown. This is understandable, as it was one of the smaller vendor rooms I’ve ever seen at a show of this size. If you didn’t collect Disney pins, there wasn’t much else to purchase. Although my Disney collecting is limited, I definitely have been known to buy Haunted Mansion memorabilia or Vinylmations from time-to-time. Because of the limited offerings in the vendor room, I didn’t even have temptation. That being said, the Saturday sell-out of the D23 Expo indicates what we’ve seen recently at SDCC and WonderCon…big things are on the horizon. Although the D23 Expo is not scheduled to return to Anaheim until 2013, I wouldn’t be surprised if the immense popularity lured the company into coming up with something next year. Like LucasFilm, Disney has no desire to saturate the market with a con-presence, but despite this Star Wars Celebrations are becoming more commonplace. Similarly, I wouldn’t be surprised if we see some sort of con or expo related to Disney in Southern California prior to 2013. Either way, the next time there is a Disney-Con of any sort in my area, I’ll be there. The new partnerships Disney has formed, coupled with the increasing frenzy by the public for Con-Culture, leads me to feel that we’ll see the D23 Expo become an increasingly powerful player in the convention scene in the very near future.